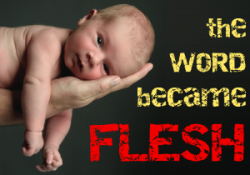 Flesh 8: God at Work? How do I do “God’s work” in my everyday job or situation? That’s the question we’re looking at today as we continue our series called “Flesh”, about the relevance and implications of incarnation for us – and the community we live in – today. We’re continuing a series this morning in which we’ve been looking at the “incarnation” – which is a big word for a deceptively simple concept, that God put on skin and became one of us. And if he did that, what does that mean for us as Jesus followers today? Wasn’t “Flesh” a Christmas series? Well, yes and no. The Christmas story is that God is with us, in a stunningly real and literal way; but that story doesn’t get packed away with the Christmas lights! So today we’re having “Not the Christmas Sermon”.